Pre Charged, Rechargeable and easier on the planet. This entry was posted on December 30, 2009 by Avel Ureño. Americans use around 2 Billion disposable batteries a year, one of those numbers that’s big enough for most of us to have no actual concept of it, but it’s a lot. If you find yourself being a larger than normal part of this statistic the obvious solution would be to use a rechargeable battery. Generally speaking a rechargeable battery will save you money over the long run, you can recharge most of them up to 1000 times before you have to replace them. The cost-saving benefits of this are clear when you compare it to disposable batteries. Though disposables can often have a higher mAh rating they just get tossed out when you’re done with them. One of the major disadvantages of the rechargeable batteries has been that they don’t come ready to use. Typically you would need to fully charge your batteries before you used them so you wouldn’t be able to just go to a store and pick some up and carry on. Often we just don’t have the time or forethought to have some spare charged batteries lying around. Another issue with rechargeables is that they never really stay charged. After a year or so they’d be generally useless to you and need to be recharged, now however there is a new type of battery that has a much lower self discharge characteristic than previously. Your standard NiMH rechargeable is below 60% capacity after about 2-3 months and essentially dead after a year. 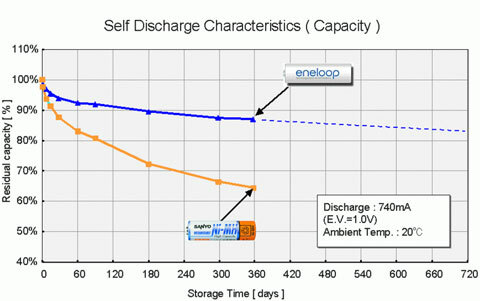 The Graph above shows the discharge rate for the eneloop battery vs one of Sanyo’s other Nickel Metal rechargeables. Hybrid NiMh cells offer the best of both worlds, you can use them out of the pack but you also get to do the environmentally friendly thing and re-use them. If polar bears had the capacity to vocalize their appreciation they no doubt would. Three of the more popular types of these batteries are the Rayovac Hybrid, Ultralast Hybrio and the Sanyo Eneloop series. Each has essentially the same characteristics, with Eneloop being the forerunner and probably the best marketed. 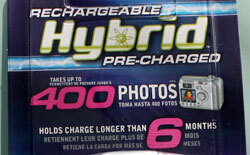 The hybrids are marketed as being a viable replacement for digital camera batteries, for instance the energizer ultimate lithium (a disposable) makes claims to somewhere around 640 photos worth of battery life. The Rayovac Hybrid battery states that it will do 400 photos. Your general use alkaline would struggle to do more than 100. Also there are the cost savings to be considered. For 8 of the Rayovac Hybrids and a charger you’d pay $23.95. Four Energizer photo lithium batteries would be around $17.95, and you can only use them for those 630 photos before throwing them away. The bottom line being that while no rechargeable can hold the power of their high end disposable counterparts, the pre charged rechargeables at the least make going the greener route a more convenient prospect. If you want the best pre-charged rechargeable, look no further than Sanyo Eneloop. It's "simply the best". In fact, Sanyo should use Tina Turner's song "simply the best" if they do a commercial for their Eneloop batteries. I'm just saying this because the post makes these claims on the graph. I'm saying it because of experience in using all of the brands. I think it's because Sanyo is made in Japan. You can actually tell by holding the battery and looking at the cap and seals around the head of the terminals. They are stout and made well. It just retains the power somehow. Not the greatest of capacity, but all of them are about the same capacity give or take 50mAh. My opinion, is buy Sanyo.